This week we’re excited to be celebrating International Astronomy Day with some great programs. 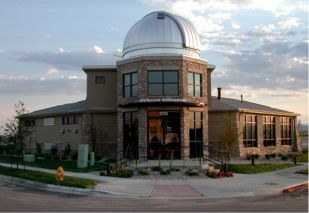 Friday night, you can join us at Front Range Community College’s Stargazer Observatory from 8-10 pm to enjoy the views through their 14-inch Celestron telescope. From this grown-up kid who used to mow lawns to save up money to buy her first telescope, I cannot recommend this highly enough! There’s nothing quite like communing with the cosmos through the eyepiece of a telescope. Friday night we’ll also be presenting a StarLab planetarium show at the observatory, and there will be hands-on space activities too. Space is limited (no pun intended), so if you’d like to join us, please register by calling 970-416-2705, ext. 1. Saturday we have a full slate of International Astronomy Day activities at the Museum. StarLab planetarium shows will be presented at 11:00 am, 1:00 pm, and 2:00 pm, where you can learn about the fascinating myths of the night sky’s constellations while viewing stars projected in a domed theater. Tickets are free with admission and available at the Museum’s front desk on the day of the shows. Members of the Northern Colorado Astronomical Society will also be on hand to display and talk about different types of homemade telescopes between 11 am and 2 pm. You’ll be able to look at our closest star, the sun, through a solar scope, weather permitting. Other hands-on activities will also be offered between 11 am and 2 pm throughout the Museum. On April 23, students from Webber Junior High in Fort Collins participated in a mock NASA launch. It might as well have been the real thing: 7th-9th graders were chosen to participate in the program by submitting applications, resumes, and references, and then given one of many jobs including astronaut, mission control staff, flight director, or engineer, just to name a few. They took their jobs seriously; as Mission Control guided the astronauts on board a life-size model of the shuttle, the room was utterly quiet. The shuttle pilot flew the “craft,” and if he crashed, the mission would have turned into a rescue operation. During the mission, the astronauts performed experiments “in space” designed by other students while the ground crew monitored the flight. A video conference with Space Center Houston halfway through the morning let students experience what it’s really like for astronauts to live in space, including how they eat…and even details about how they go to the bathroom! Space is such an engaging topic for students. They are enamored with the idea of space travel, and it motivates them to increase their science, math, engineering, and technology skills. These students were not just “playing” astronaut—for two days they WERE part of a NASA mission, even designing their own mission emblem. Colorado has many connections with NASA, through a plethora of companies that produce, design, or build components for space missions. Discovery Science Center and the Fort Collins Museum are also part of Virtual Space Community, an educational outreach of Space Center Houston.